It has taken me three years to cultivate a single bloom from my climbing Eden Rose. It is not easy to find Eden Rose in local nurseries. Search for this rose in pot and bareroot form for sale online. Heirloom Roses is one source for it in a pot. I first planted my Eden Rose in too shady a spot where it struggled. Finally, this winter I transplanted it to my potager arch to co-mingle with my young Golden Dorsett apple trees. It is very happy now, and has exploded with happy blooms. Eden Rose is a versatile repeat bloomer with an unusual blend of pastel pinks, creams, and yellows. I simply love this rose, and it reminds me of Provence! 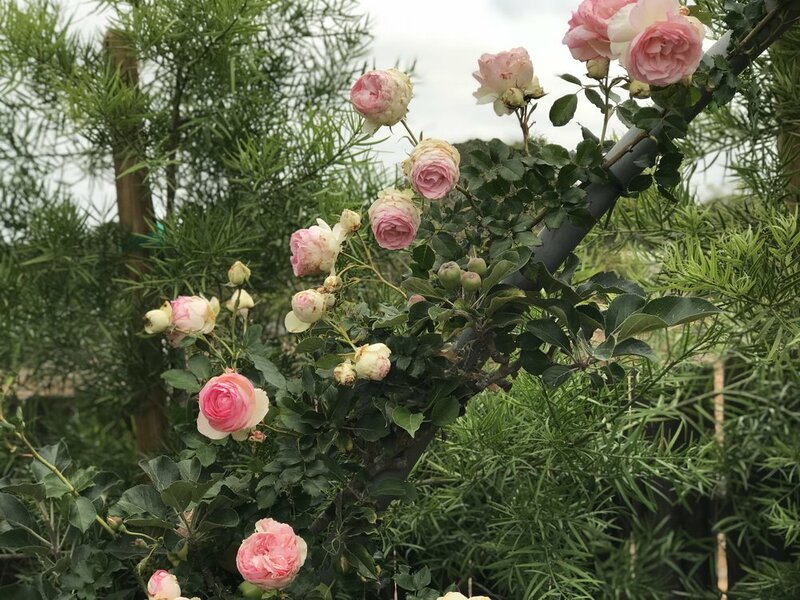 I saw and recognized Eden Rose while visiting the magnificent potager, Bastide des Saveurs, near the village of La Cadiere-D'Azur in the Bandol Region of Provence. Here is a link to my past post and visit with Chef René Bérard in May 2015. Chef René Bérard told me this rose was called Pierre de Ronsard. In the back of my mind, I knew it had another name, and did some exploring. According to Wikipedia, Eden Rose, also known as Pierre de Ronsard was created by Marie-Louise Meilland in France by Meilland International in 1985, as part of the the Renaissance Collection. Bastide des Saveurs is Chef René Bérard's potager and location for cooking classes. For a treat, visit his website for more information on his quaint family-owned hotel, restaurant, spa, and cookery school, Bérard Hostellerie.